With Pakistan Muslim League-Quaid (PML-Q) President Chaudhry Shujaat Hussain set to send references against its eight lawmakers to NA Speaker Fehmida Mirza today (Thursday) under the defection clause 63-A, PML-Likeminded Secretary-Information Kashmala Tariq has questioned Shujaat’s authority as the “party head”, saying Article 63-A would only be applicable after next election. “Under the direction of the party chief Shujaat Hussain, our lawyer SM Zafar will submit the references against the party’s eight defecting lawmakers under Article 63-A to NA speaker today,” a source said. This would be the first case to be examined by the NA speaker as well as new Chief Election Commissioner Justice (r) Fakharuddin G Ebrahim. Ebrahim would face a test as he was nominated by the PML-N that is an ally of the PML-LM, whose five MNAs are facing disqualification. All eight members of the National Assembly who were elected on the PML-Q ticket in 2008 election had abstained from voting for Prime Minister Raja Pervaiz Ashraf against party’s decision to support the PPP’s nominee. A source in the PML-Q told Pakistan Today that the party leadership had decided to send references against the party violators in view of the recent developments. 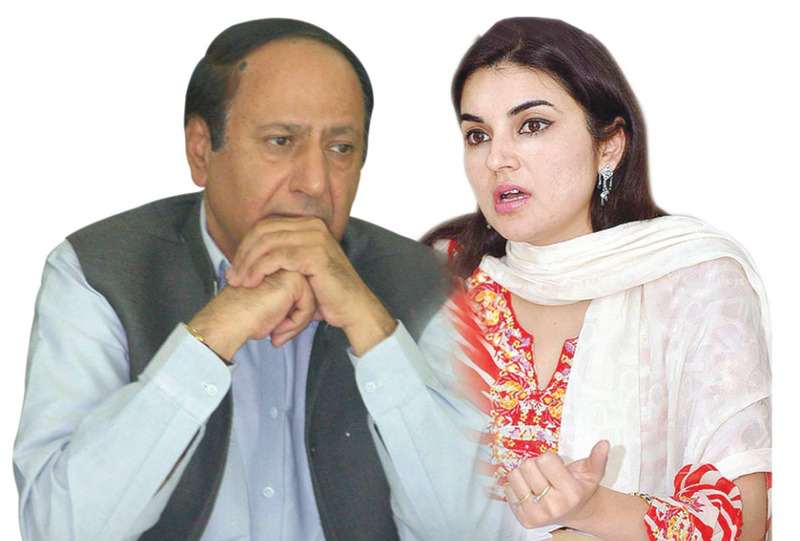 “The party leadership has decided to send references against including Kashmala Tariq, Amir Muqam, Krishan Chand Perwani, Ghulam Haider Samijo, Humayun Saifullah Khan, Khadim Hussain Wattoo, Asim Nazir Jutt and Awais Ahmed Khan Leghari under defection clause as none of them have responded to our show-cause notices served on them until August 2, the deadline mentioned in the notices. Now, they would have to face the music,” PML-Q Deputy-Secretary Information Mustafa Malik told Pakistan Today. He said that the party’s leadership, including Adviser to PM Basharat Raja, Women’s Wing President Farrukh Khan, Faqir Hussain Bokhari and others remained in the PML House on Thursday afternoon, but they received no response from any of the lawmakers in question. “However, Krishan Chan Perwani and Kashmala Tariq’s rejoinders were received at around 4pm after the deadline had lapsed. Hence, disciplinary action has been initiated against all eight lawmakers,” he said. Malik said Sumaira Malik and Dr Donya Aziz had also avoided the prime minister’s election but both of them had informed the party leadership about their prior plans to visit abroad. Sumaira was in Saudi Arabia to perform Umrah while Donya Aziz was in the US when Ashraf was elected the prime minister. In her rejoinder to the show-cause notice, Kashmala took shelter under the argument that the Article 63-A was not applicable until next election and that the notice in question was a “nullity” in the eyes of the law and the constitution, having been issued by a functionary not envisaged by the constitution. In order to save her skin, Kashmala also dragged members of her own group and the Unification Bloc in the matter, stating that she along with Krishan Chand Perwani had been targeted because they were elected on reserved seats while others had been spared. She said the Unification Bloc of the PML in the Punjab Assembly had consistently voted in favor of the PML-N government. “This is despite the fact that the alleged leadership of the PML-Q sits in opposition and has the policy of opposing the money bills. As no action has ever been taken against the Unification Bloc, this clearly establishes that a mere decision of policy made by the party does not constitute a direction by the party for purposes of Article 63-A”. “There has been no explanation forthcoming as to why the two of us have been singled out and this clearly is an arbitrary, malicious and discriminatory singling out of two individuals”. “The notice issued to me specifically states that it has been issued in capacity as the alleged ‘party head’ of the Pakistan Muslim League. However, it may be noted that the issuance of such a notice by the ‘party head’ is clearly in violation of the provisions of Article 63-A of the constitution that are applicable to me. Any notice issued to me is constitutionally required to be issued by the ‘Head of the Parliamentary Party’. As the notice has admittedly not been issued by the ‘Head of the Parliamentary Party’, it has no constitutional and legal value,” she said. “It may be noted in this regard that Article 63-A of the Constitution was amended by the 18th Constitutional Amendment. Through the aforesaid amendment, certain changes were made to Article 63-A, however, it is stated in Article 63(8) that Article 63-A substituted as aforesaid shall come into effect from the next general elections to be held after the commencement of the Constitution (Eighteenth Amendment) Act, 2010”. She said, therefore, the issuance of the notice in capacity as the alleged “party head” was in complete contravention of law and the constitution and the notice was liable to be set aside as being a nullity in the eyes of law. Hence, no action can constitutionally be taken pursuant to the notice, she added. “In any event, Shujaat is neither the legally and constitutionally recognized ‘party head’ nor is he the ‘head of the parliamentary party’ in the National Assembly”. She said the matter regarding the elections for the leadership of the PML-Q was currently sub-judice before the Lahore High Court and in view of that fact, the self-proclamation of Chaudhry Shujaat Hussain to be the ‘party head’ or the ‘Head of the parliamentary party’ is nothing but an act of usurpation not entitled to any recognition under the law. Kashmala also questioned the election of the PML-Q held in 2009, stating that in the absence of a clear mechanism and intra-party elections through which the leadership was elected by the party members and until the court decided this matter, it was by no means possible for Shujaat to claim that he was legally the ‘party head’ or ‘head of the parliamentary party’ of the party. “Furthermore, in any event, Chaudhry Shujaat Hussain cannot claim to be the ‘head of the parliamentary party’ in the National Assembly as he is not even a member of the National Assembly. It may be noted that as per the terms of Article 63-A(1), the head of the parliamentary party must forward a declaration issued under Article 63A(1) to the presiding officer. This clearly shows that the head of the parliamentary party is different based on the House in which the members are sitting. Therefore, Article 63A(1) clearly requires the appointment of the head of the parliamentary party in the National Assembly, the Senate as well as the four provincial assemblies of Pakistan and the same person cannot claim to be the head of the parliamentary party in all these Houses.” Kashmala also referred to the ruling of Chaudhry Afzal Sahi, former speaker of the Punjab Assembly in 2005 on a point of order for ‘determination of the head of the parliamentary party as envisaged under Article 63-A’ wherein it was held that ‘before filing a declaration under Article 63-A [a person] must prove their authority as ‘head of the parliamentary party’ in the light of constitutional and legal provisions. “Therefore, without prejudice to any other position taken herein, the notice is unlawful as Chaudhry Shujaat Hussain is, in any event, not the ‘party head’ or the ‘head of the parliamentary party’ in the National Assembly,” she added. She also challenged the charge that she had abstained form the voting process held for the PM. “In fact, I was absent from the floor of the House. Absence from the House cannot be equated to an abstention from voting for the purposes of Article 63-A, as Article 63-A only prohibits abstaining from voting contrary to any direction issued by the parliamentary party”. Please,dont filerefrence against Kushmala Tariq.She is very cute. Please send her back to the backyard of Shahi Qila, Lahore – her origin.